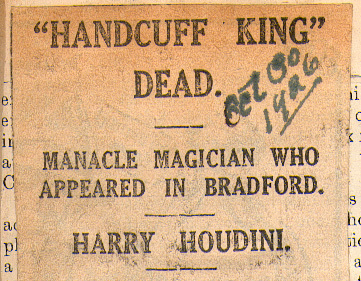 Harry Houdini, the world famous magician, who made his first professional appearance in this country at the Palace Theatre, Bradford, died at Detroit, yesterday, says a Reuter message, following two operations. He was a victim of peritonitis. Known as the “Handcuff King” Houdini was born in the United States in 1874 and was the son of the Rev. Dr. Meyer Samuel, but changed his name under deed poll. He began his versatile career as a trapeze performer, and afterwards became known throughout the world by his feats of escaping from handcuffs, chains and bonds which baffled the experts. Appearing in a new role he was awarded a prize by the Australian Aeronautic League in 1910 being the successful flier in Australia. 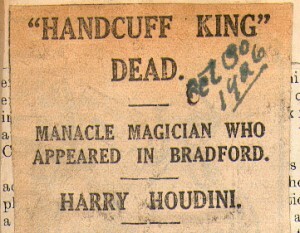 Mr Houdini was the author of several on subjects ranging from handcuffs to “spooks and spiritualism”. Managers fought shy of the magician when he first came to this country, but Bradford received him and was amazed by his feats. After appearing at the Palace Theatre he was engaged for the City Varieties, Leeds at a big fee.